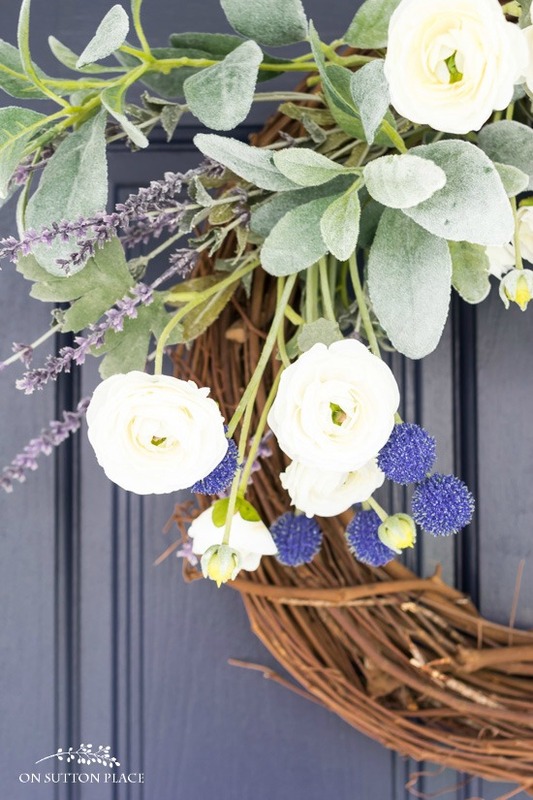 Use ranunculus, lavender, lamb’s ear, and little billy buttons to make this Summer’s Eve Grapevine Wreath. Perfect for your summer front porch! Welcome to the first outdoor decor post of the season! We’re kicking off with the most logical place to start, which is (in my opinion) the front door. 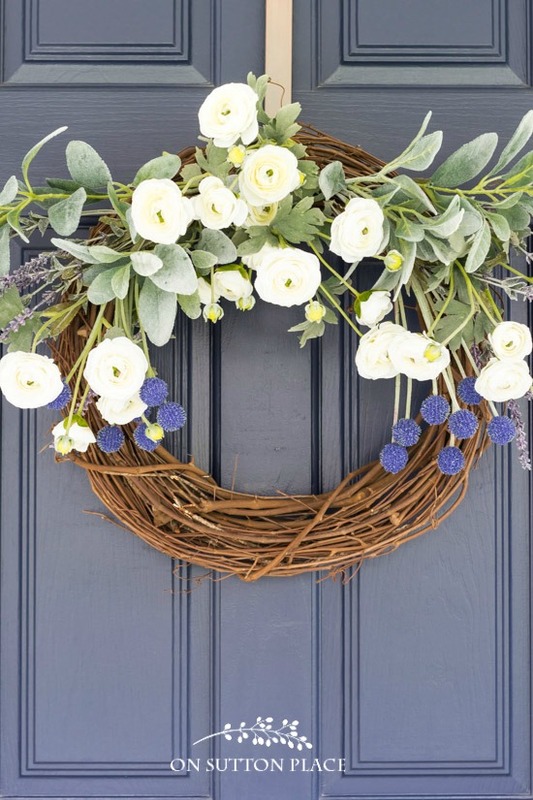 Since we’re well into spring but it’s not quite summer, I’m calling today’s project a summer’s eve grapevine wreath. There is no glue and no wire…and it’s easy. *Note: When I was making this wreath, I had in mind that the flowers would be on the left side, so I photographed the assembly that way. When the wreath was finished and on my door, I changed my mind! It looked much better with the flowers on the top. The assembly is the same no matter how you hang it. Place your wreath on a flat surface and determine the top. Attach a wire hanger. With wire cutters, cut all the stems 4 to 5 inches below where the leaves end. 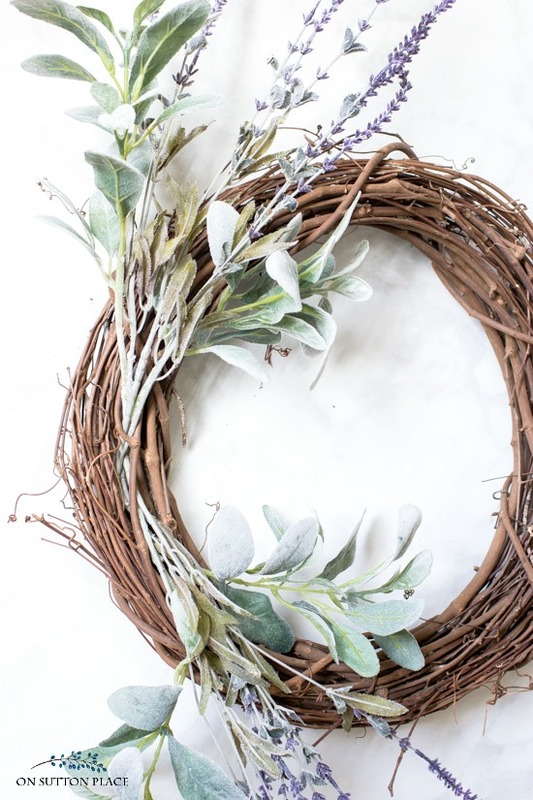 Insert the lamb’s ear stems into the top center (or side) of the wreath, going in opposite directions. Insert the lavender the same way. Next is the ranunculus. Insert two stems going in each direction and one in the middle. They should have depth and be a little floppy. Complete the arrangement by inserting the billy buttons so they hang down under the ranunculus. As always, you can substitute any flower stems you like or have on hand. The wreath assembly will be the same. Just start at the center and work out in opposite directions. The next few weeks are going to be busy ones here on the blog and for me at home. I’m trying to get my outdoor spaces put together and I am so ready to plant my herb garden. As always, I hope you can join me as we celebrate the arrival of spring and summer. Click HERE for front door color. 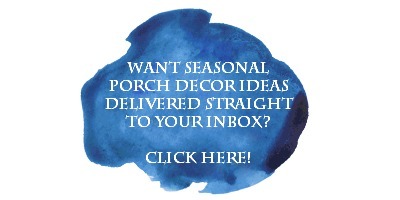 Your porch looks beautiful, as always! 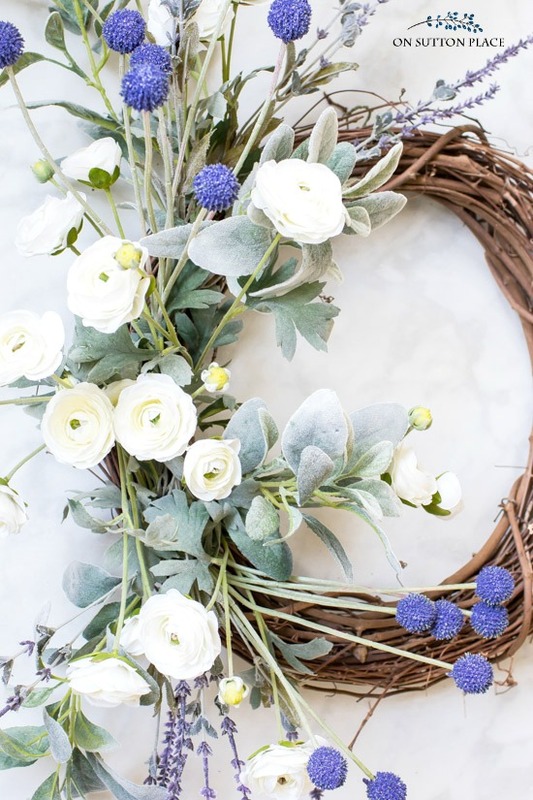 Love the wreath and it’s so simple to make (which I love). I really like it hung sideways with flowers on the left, too!! Your front porch is lovely Ann! Actually everything you share, post and blog about is lovely! This wreath is beautiful! Thank you for sharing materials and instructions; I am going to Hobby Lobby today for some additional flowers and try my hand at making one! Oh, Ann, I think this is your best wreath ever. It is just beautiful! We painted our door Naval after seeing yours. I would love to make a wreath just like yours if only I can keep the birds from making a nest in it! This wreath is beautiful! And I appreciate the step by step instructions. Use different stems? No way! I love your whole front door arrangement. 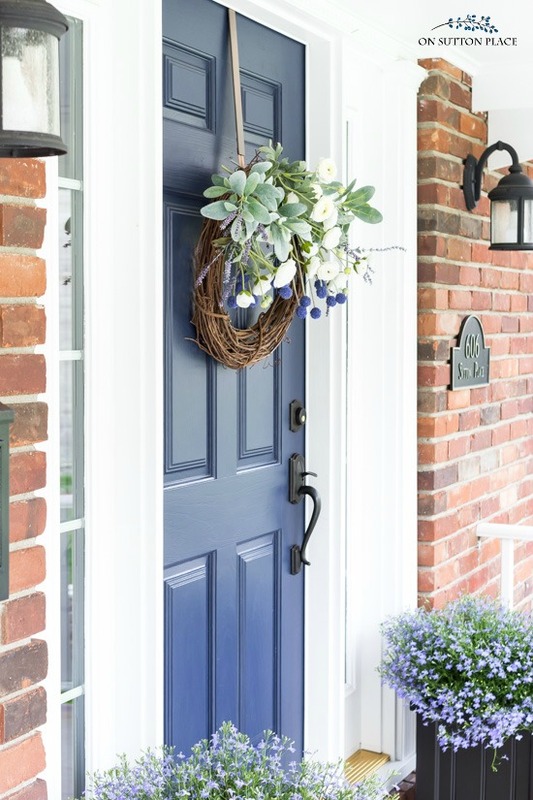 What color of paint is on your front door? It’s all beautiful!! Beautiful as always you are always an inspiration to get started on projects. I always enjoy all of your recipes and love this grapevine look. I have the wreath just need to get the flowers. Love the look. Very pretty, loving the muted tones and the billy buttons add a little more color.I used those same lavender stems in a wooden gardeners box for an arrangement. Thanks for the instructions, looks easy. I agree with your decision to hang the wreath with the flowers at the top. I am going to try making this for myself. I also love the Lobelia in your planters and how it works with your blue door. I just love the combination on flowers on this wreath Ann. I plan to make one. Your front porch is always inviting. Love the smokey look of the lambs ears. Will hit Hobby Lobby tommorrow and hope I am able to replicate your beautiful wreath. Reviewed some of your previous posts on porch decor. Thanks for making the history of posts so readily available. And so love seeing little Kelly! Grateful for your blog, and grateful for spring!!! As always, you hit it out of the ball park!!! It is lovely and so refreshing. I love the wreath. The tutorial is great, I might give it a try. If I may ask, what are the flowers beside the door, they are gorgeous. I really enjoy your posts. Hi Dorothy! It’s lobelia. I am going to share more about that in an upcoming post so stay tuned! Love the wreath. I am not a crafty person but I think even I could make it. Going to give it a try! Thank you for sharing. 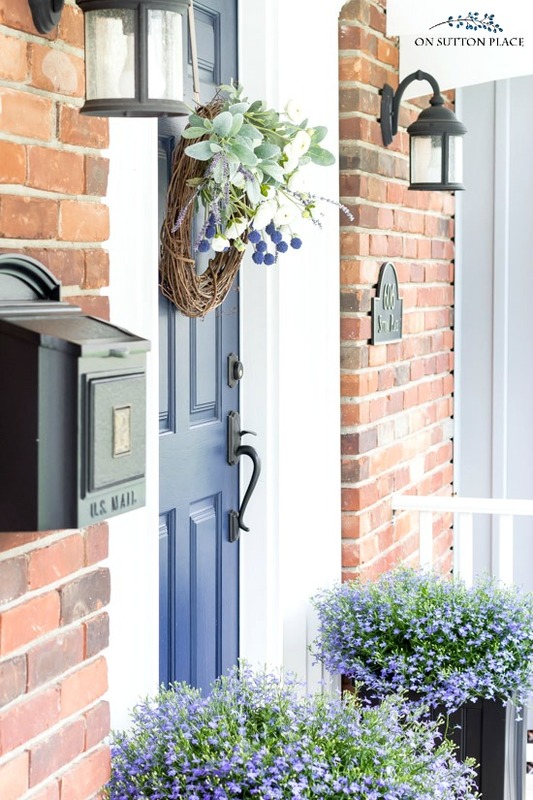 Also…..love your mailbox. May I ask where you found it? Hi Dodie…I added a shopping widget to the post (at the end) so you can look at the mailbox. This is absolutely stunning Ann! Your tutorial is so helpful to put this together. I will check at our local Hobby Lobby for the flowers. Have a beautiful Sunday! Love the front door and the wreath looks perfect. 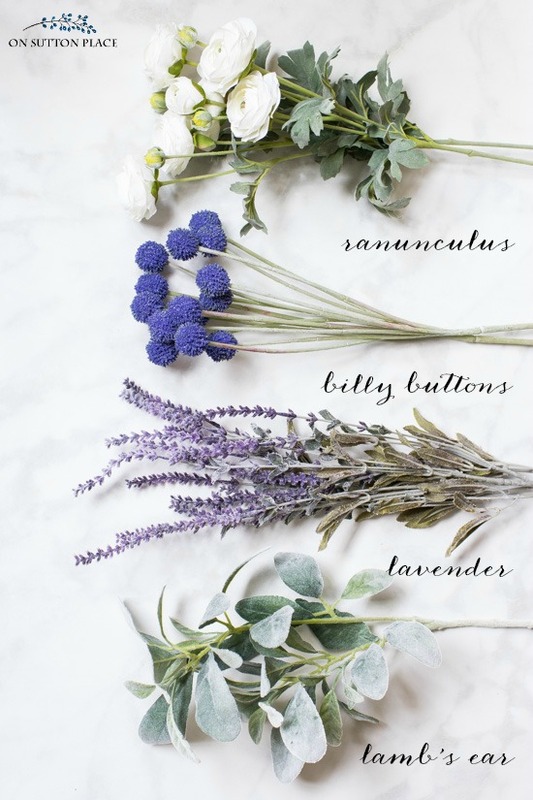 The Lavender and billybuttons are perfect with the ranunculus . No bow needed with those colors and textures! I’m inspired to make one. Love your Website. Ann, Thank you again for a beautiful idea. I think I’m going to have to make two of these. One for my mom for Mother’s day, and one for myself. I love the wreath and your door color. Whats is your pots? Hi Janice! It’s lobelia. I’m sharing more info on that in an upcoming post. Stay tuned! I’ve retired the various wreath hangers I’ve always used for our front door. Instead I use one of those genius Command hooks and a wire edged ribbon. A small matching bow or another silk flower hides the Command hook. Or you can place an upside down Command hook on the inside of the door and run the ribbon over the top, front to back. That upside down hook makes a nice way to hang things on kitchen cabinet doors as well. Wreath hangers aren’t unattractive but they tend to scratch door paint. And I just plain luvvers wire edged ribbon.